DOMESDAY (AUS) (Brown 2002-Stud 2006). 2 wins at 2, STC Silver Slipper S., Gr.2. Sire of 418 rnrs, 250 wnrs, 12 SW, inc. Pressday (BRC TJ Smith Classic, Gr.1), Doctor Doom, Arcadia Dream, Domesky, Heart Starter, Antelucan, Divorces, Oregon's Day, Italy, Cailin Miss, Sunset Rock, Backgammon, SP Ruthven, Daysee Doom, Five to Midnight, Supara, Whatalovelyday, Giresun, Nextanix, Mr Optimistic, Actuariat, All I Survey, Boom Box, Cathy's Mark, etc. FOLK ROCK, by Fastnet Rock. 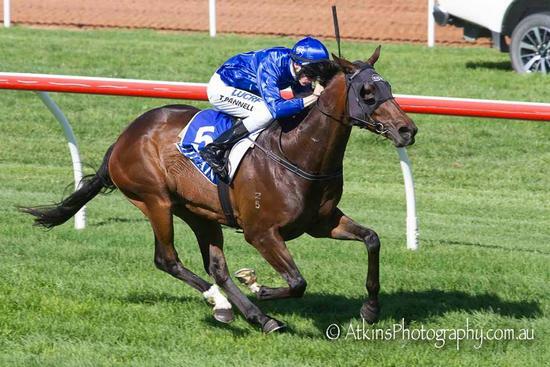 3 wins to 1450m in Aust. This is her first foal. Fast Folk. Winner at 2, 3d ATC Become an ATC Sponsor H.
Folk Rock. 3 wins. See above. Japhite. Placed at 3 in 2016-17 in NZ and Aust. JEUNE KING PRAWN (Danehill). 8 wins-2 at 2-from 1000m to 1600m, HK$9,531,720, HKJC Champions Mile, L, Sha Tin Futurity Trophy, L, Sports Club Golden Jubilee H., National Day Cup, Aetna Shirazee Region P., Success Partners H., Chevalier Network Solutions H., Chuk Yuen H., 3d Hong Kong Classic Mile, L, HKJC Stewards' Cup, L. Sire. Final Conqueror - Deja Vu (H.K.). 4 wins at 1200m, 1350m, A$29,050, HK$2,344,625, to 2015-16 in Aust. and HK, Guangdong-Hong Kong Cup H., HKJC Wong Cup, HKU Alumni Association H., 3d HKJC Pyramid Hill H., On Ting H., Kestrel H.
Henry the Createth. 3 wins-2 at 2-at 1100m, 1200m, A$79,800, to 2016-17, ATC Piper-Heidsieck 2YO H.
Neptune Raider. 4 wins from 1000m to 2250m, SAJC Marion H., Legacy Widows H., 2d SAJC Brunnhilde H.
Sunset Pass. 4 wins from 900m to 1600m, AJC Indian Summer Quality H., 2d AJC Ambarvale H., Centennial Park H., Elusive H., 3d AJC Woodbine H.
Military Attache. 4 wins from 1300m to 2400m, AJC Five Dock School 125th H., STC Fine & Dandy Welter H., AJC Sir Regent H., 2d AJC Toi Port H., Empyrean H., FW Duesbury H.
KOONOOMOO (Dubleo). 5 wins to 1400m, A$460,296, VRC Herald Sun S., Gr.3, MRC Le Pine Funerals H., MVRC Mitchelton Wines H., Andrews & Parker Furniture H., 2d MRC Tristarc S., Gr.2, VRC March S., L, MRC Sportingbet Series Final S., L, 3d VRC Frances Tressady S., Gr.3, MRC Geoffrey Bellmaine S., Gr.3. BANTRY BAY (Tale of the Cat). 3 wins at 2, A$222,000, SAJC Sires' Produce S., Gr.3, VRC Anzac Day 2YO H., MRC WJ (Bill) Adams 2YO H. Producer.